Just like us humans, our furry feline friends also have individual preferences in food. Some cats would prefer dry food over wet food. Some would gobble almost everything that is served to them. But then there are also those that cannot help but be picky with what they eat because of a sensitive stomach. This is where the best cat food for sensitive stomach can be of great help. The challenge of taking care of a cat or any other pet that has a sensitive stomach is that they cannot talk and say directly that their food makes their digestive system act out and irritable. The danger here is that at times, our beloved cats would still eat the food even though it would harm them, just like how adult cats that are lactose intolerant drink milk even though it will harm them. If you don’t have the time to make your own cat food or is not confident enough to do it, you can always purchase it. I made a list of the best there is right now. 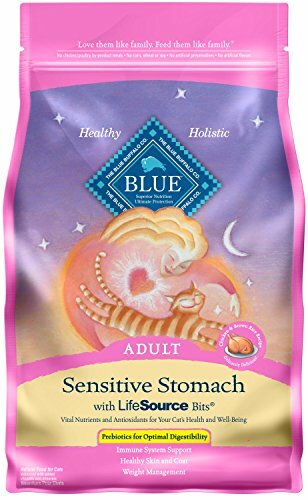 Take a closer look at my top five best cat food for sensitive stomach available today. Just like all of the pet food on the blue buffalo life line, this particular variant contains “lifesource bits,” which provides our pets with vitamins, minerals, and antioxidants that would help them grow and sustain a healthy life for every life stage. One of the common worries of us pet owners is that sometimes, cats can be very picky. That is why blue buffalo ensures that our furry friends will enjoy it up to the last bite by infusing it with real deboned chicken and fish oil. It keeps the stomach calm and eliminates irritation. The “lifesource bits” contain anti oxidant ingredients such as berries, apples, and pomegranates. It has a very strong and delicious chicken flavor that cats love. It has the perfect balance of vitamins, minerals, and fiber to ensure that our cats will have adequate nutrition without harming their tummies. Its high mineral contents might also be a cause for UTI or other related diseases. Remember to gradually integrate this cat food to your pet’s diet instead of giving full serving right away to prevent vomiting or irritation. Aside from making sure that our pets will not have a hard time digesting this food, this highly formulated cat food also specialized in providing a healthy and beautiful coat to your cat. Amongst the fortified minerals in this mixture are omega 6 fatty acids and vitamins C and E, all proponents of a healthy skin and fur. It is made with high-quality, all-natural ingredients and does not contain any artificial color, flavor, or preservatives. It has an easy to digest formulation that is perfect for even those with the most sensitive stomach. It also focuses on improving dry skin and causing a shiny and healthy coat. It contains omega-6 fatty acids, vitamins C and E, and other antioxidants for a healthy tummy that also reflects through a healthy skin and fur. 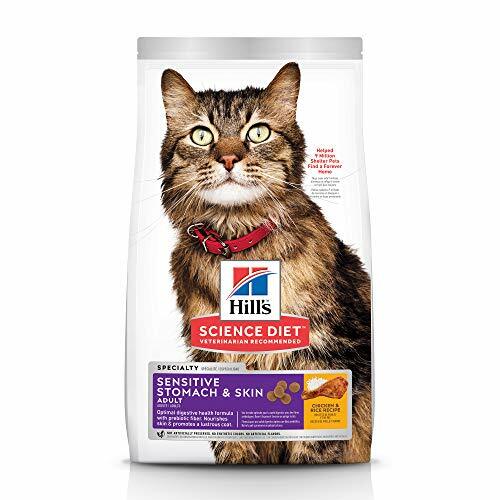 This is not the cat food for you if you don’t want your cat to gain weight. Gradually integrate this to your cat’s diet to minimize vomiting. would be able to get their daily need of protein without stressing out their digestive system. And with the 25 essential vitamins and minerals that it contains, you are ensured that your cat is covered 100% of their required daily intake. It has a high concentration of protein and fiber while being easy to digest. The high protein content replicates the natural diet of feline carnivores. It is all natural and doesn’t have any artificial colors. This cat food contains 25 essential vitamins and minerals to ensure that your cat is properly nourished. The challenge is making the cats eat the cat food since it doesn’t offer much regarding flavor. You should gradually integrate this cat food on your pet’s diet to avoid vomiting and disinterest. 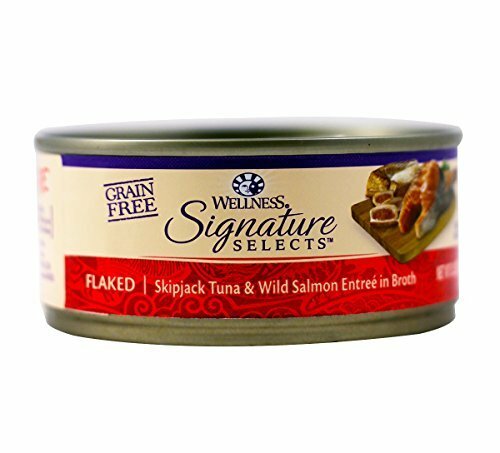 This is the closest that you can get with providing your cat her natural diet. It is made with 95% meat and 5% fruits and veggies with no grain or gluten included. Just like how it should be for carnivores. With its high protein content and nutrients such as amino acids and omega 3, your cat will always have strong bones, high muscle density, and a healthy fur. There will be no issue with an irritable or sensitive stomach since this food is just how cats in the wild nurture themselves naturally. This cat food is made with 95% meat and 5% fruits and veggies, just how cats in the wild eat. It is gluten-free and grain-free, perfect for sensitive tummies. It has no artificial colors, flavor, or preservatives. It is fortified with essential vitamins and minerals for strong bones and muscles and healthy skin and fur. Since it is all natural, it is not healthy to store it for a long time, especially when already opened. It might cause cat litter to smell stronger due to the high organic content. Aside from providing all the nutrients needed by cats to survive, there is one more thing that this cat food is focused on which is moisture and hydration. Since cats don’t naturally have a strong thirst drive, this cat food ensures that cats are properly hydrated every time it gets a serving. It has all-natural, premium cuts of meat without any extenders or by products added. You are sure that your cat is only eating what it needs to eat. There are no irritations, no upset stomach, only healthy and strong cats. The tuna and salmon combination is very hard for any cat to resist. It will surely eat each serving any time. It doesn’t contain any by-product, only of high-quality, premium meat. It is grain-free, gluten-free, soy-free, and also free from any artificial flavors and colors. Each serving is formulated to meet a cat’s hydration requirements. It has an easy-to-open can to make feeding time simple and mess-free. It contains carrageenan. Although safe to consume by pets, this is made seaweed which has a little nutritional value and is not a part of a cat’s natural diet. Since it is all natural and without preservatives, it might have a strong fish smell that might be bothersome to humans. The key here is being sensitive and knowledgeable on the signs that your cat might be suffering from a sensitive stomach. You have to understand that sometimes, having a clean food bowl and food container is not enough. Knowing the signs of a sensitive stomach would prevent your pet from suffering and even death. Listlessness in cats can mean a lot of things, but if your pet is interested in any other activities such as playing and cuddling but is disinterested with its food, chances are it is suffering from sensitivity to the food you are feeding it. This is a very obvious sign that your cat is suffering from a sensitive stomach. When you check the litter box and see that your cat regularly passes liquid or has difficulty in doing its business, it is definitely time to change its diet. When it comes to vomiting, you have to understand the difference between vomiting and regurgitation. Regurgitation is a natural means of ridding a cat’s body of undigested food. It happens along the esophagus area and is normal in healthy cats. When it happens, the cat doesn’t seem to be in pain or suffering, and the output is cylindrical. When a cat vomits, it is very obvious that the cat is in pain as the food is ejected forcefully from the stomach or intestinal area. As soon as the cat releases the vomit it usually drools or retches in relief. A sensitive stomach might cause a cat to vomit. It can also be a sign of other diseases. Take note that it the vomit contains traces of blood, it is imperative to bring the cat to the vet immediately. To ensure that your cat will ingest its food without experience irritations, the ingredients must be meticulously chosen, leaving out anything that the cat’s tummy cannot tolerate or anything that causes allergic reactions. The perfect cat food for sensitive stomach should include chicken or turkey meat, egg protein, wheat, rice, or oats. Eggs, chicken, and turkey are good sources of protein while wheat, rice, and oats are good sources of fiber. While the best way to go is to bring your cat to the vet if they have the symptoms discussed above, if you are sure that your cat has a sensitive stomach, you can just change its diet to a more stomach friendly concoction. Here are some easy to cook recipes for your stomach-sensitive cat. Get two large bowls. On one bowl, mash the chicken or turkey meat with the vegetable oil and water, while in the other bowl, mix all the remaining ingredients. Mix the contents of the two bowls, ensuring that it is mixed evenly and devoid of lumps or patches of unmixed ingredients. Make the dough by hand and roll it to achieve a thickness of around a quarter inch in diameter. Place the tiny pieces on a greased sheet and bake it for 20 to 25 minutes, tossing the bits, so it browns evenly on all sides. Cool the bits completely before taking it out of the oven. Put the bits in an airtight container and refrigerate it for a long shelf life. Just simply put all the ingredients in a blender or food processor and blend it until it reaches your desired consistency. You can store it in the fridge for up to three days. Well, you see that’s my short review for each product. 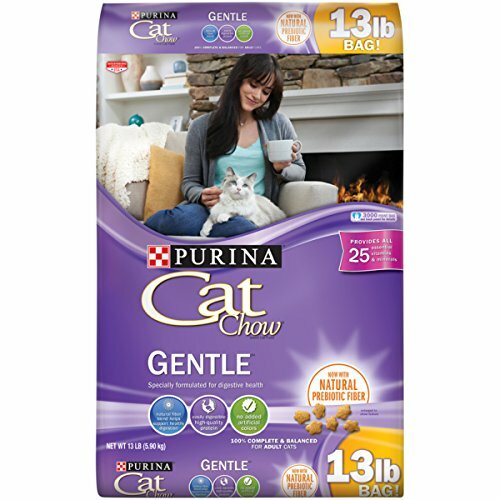 For dry cat food, the best cat food for sensitive stomach for me is the Purina Cat Chow Gentle Dry Cat Food. This company has earned our trust in providing quality pet foods, and this particular one does not disappoint. It ensures that our cats are nourished with 25 essential vitamins and minerals without making their stomachs upset. And since it is dry, storage and shelf life are longer and more convenient. 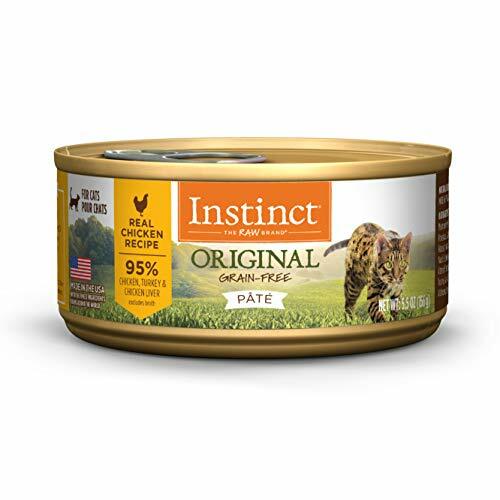 When it comes to wet cat food, I recommend the Instinct Grain Free Recipe Natural Wet Canned Cat Food by Nature's Variety. It is the closest as any food can be in terms of a cat’s natural diet. The 95% meat and 5% fruits and vegetables are helpful to your cat’s nourishment. The absence of grain, soy, and gluten ensures that your cat will not have an upset or irritated stomach.